Voracious Spriggan is a common Agility creature card. It is part of the Core Set. In addition to the card's availability in the Core Set, one copy is obtainable in the Black Marsh Smugglers deck as a reward from Unwelcome Intrusion. 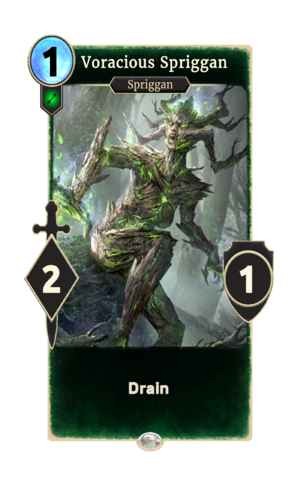 Spriggans first appeared in Daggerfall, and have since been a fixture in the series, reappearing in Bloodmoon, Oblivion, Skyrim, and ESO. For more information on Spriggans, see the lore article. This was originally a rare card, but was changed around 10/2016 to help balance quality of common cards.